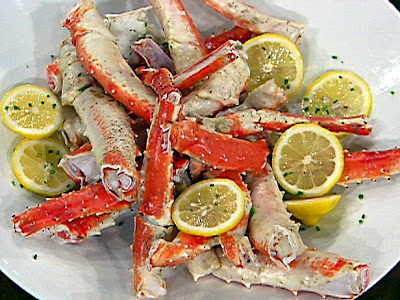 I realized tuesday night that it was deadlist catch final show, well I decided to cook crab legs again for dinner, last time I cooked them it was the night the season started, so our new tradition is crab legs on season start and crab legs on season end! I made king crab legs, baked potatos and ceasar salad, it was so yummy!! 20.00 for crab legs, man, I can't believe we used to pay 40-50 dollars in a restaurant when they are so easy to make at home! No more bearing sea for awhile, I will miss the boys on the cornelia marie, and grouchy old Sig! Hey I started a cooking blog so you can follow along as I try new recipes and finally learn to cook! Click on the cartoon on the left side of my blog right under my etsy store banner. Well, as you all know I live , love, and work with my husband - every day 24/7...so when he goes out of town or I go out of town, I really like to do all the things I don't get to do when we are together.. for me, it is wander around shops like williams sonoma and anthropologie and crate and barrel..then I come home and cook all these neat recipes with stuff like onions and garlic and lots of bell peppers and spinach....yeah, I am a happy girl! Also Make sure you check out my husbands blog for some big news http://www.infernomotorsports.blogspot.com/ and Colleen Mcgraws blog http://www.beadmetaler.blogspot.com/ for some exciting news about our bingo day today! Yeah, I win again! Oh I will share my recipes later, for now enjoy this, and just let me breathe the air, for if there is one thing in my life that is missing it is the time that I spend alone! 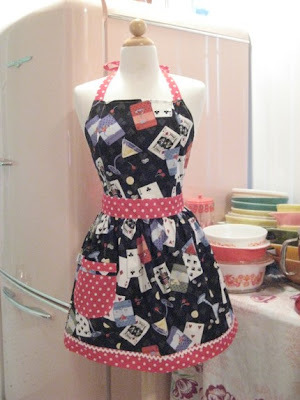 I learned from my friend Myler, you must cook in an apron, so I went online and bought a cute one that says Conserve water drink wine, but I have to cross stitch that one, so in the mean time I needed one ready to go....I went on etsy and found BooJiBoo, she makes real cool looking aprons....Here is the one I bought, It is so Vegas-y, (you know I love Las Vegas!) it arrived a couple days ago and my cooking already tastes better!! hee-hee! Ok here are some tips I learned from a master chef of 20 years..so pay attention! 1. Spinach is only good for you if you cook it!! Raw means nothing, only cooking releases it's nutrients! Good thing I love cooked spinach! 2. Where are your spices for cooking?? If they are in the cupboard next to the stove, throw them out they are useless!! Keep your spices in a cupboard far from the stove in a cool dark cabinet or pantry!! I moved mine to the pantry today and will replace them as I need them, because mine are probably dead anyway! They only last 3 months (even less next to the stove) and you should try to use fresh spices and herbs when cooking. Ok hope you learned something and I hope you can benefit from my class, I am taking another one in August! So stay tuned! Wow that was fun! About 15 of us were there, and 2 chef's. We got to stand at counter and help chop and mix and watch the chefs prepare stuff as they taught us various tips and techniques! We made the appitizer and ate that while we learned to grill chicken the right way! He had a big huge grill, once he grilled it he let it rest while we prepared the salad, then he sliced the chicken and it was so moist and delicious! I know I can grill chicken! Then we had steaks to grill we each picked our own steak and then learned how to grill beef, no more cutting it to see if it is done, no more poking it with a fork, my steak came out perfect and I grilled it!! A nice shade of pink but no raw! The potatoes were fabulous, I love potaoes and onions anyway, this was a wonderful recipe! The dessert was so easy and tasted so fabulous! Just butter one side of pound cake slices and grill the butter side down, plate it, and ladle on a fruit compote and whip cream, yummy!! I was stuffed and have lots of notes to re-write and orginize, all in all is was a very good experience, and I highly recommend http://www.creativecookingschool.com/ to anyone here in Las Vegas! I am hoping to take more classes in the future! I have a cooking class tonight at the culinary school, we are doing a grilling class. I am very excited to take this as we have that bbq we bought that costs a lot of $$..so I really want to cook more then hot dogs and hamburgers on it! I will let you know how it goes in tomorrows post! Stay tuned for more fun in the Vegas sun!! Yeah, it has been triple digits here...107-117!!! Wheeeeee!!! I am a nice shade of golden brown, like a bag of brown sugar...hahahahaha! I made a pineapple cup for my pina colada! 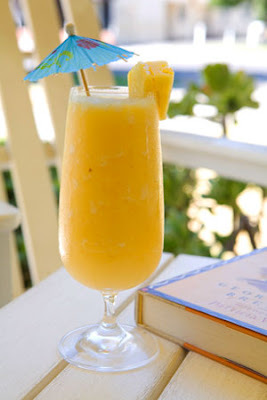 Just cut the top off a pineapple, core it out and put in the freezer until drink time, then it is ice cold and stiff, pour your pina colada in and it will keep your drink cold and yummy!! Don't forget the umbrella and straw!! Me, Travis and Rebecca at the golden nugget shark pool, we just had breakfast at the buffet, it was horrible, it use to be real good. Plus Travis drank too much last night so he is hung over and has hat hair! Had a fun time hanging out in the pool, hope they come back soon for more pooltime fun! Nothing much going on right now, Travis and his girlfriend Rebecca are coming to visit friday, so I hope it is not windy, we are going to hang out in the pool. Maybe I will bbq up some ribs, corn and salad. Summer is in full swing, and I love it! Nothing better then Pina Coladas poolside! I am taking a cooking class on July 17th to learn to backyard grill, since we have a big grill outside I really want to learn how to use it more and cook outside so I don't have to turn the air down to 60 to cook inside! Well, have a great week and get out and have some summer fun! I am very lucky to have a husband who loves me! And likes to get rid of me once in awhile too! 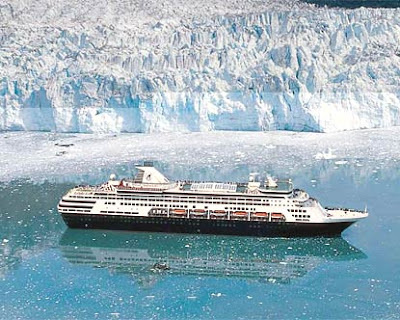 I signed up for a scrapbooking cruise to Alaska..
it leaves August 6 -14 of 2010! So I have a whole year to pay for it. My sister and her husband signed up and are going as well! We set sail for 8 days of fun, scrapbooking, beautiful sights and much more with educator and designer Teresa Collins and her husband Ty. Teresa has wonderful kits and teaches us how to make fabulous things with our Zutter binders! Accommodations onboard the ship, port charges, all taxes, all meals, entertainment & activities, cocktail party, ScrapMap totebag, scrapbooking classes with educator and designer Teresa Collins and personally escorted by a member of Team ScrapMap! You know being the music lover that I am, I can't ignore the fact that Michael Jackson died. He was a musical genius and like all genius's they have emotional baggage. celebrities have it even worse, so he was cursed from the start, he was never going to be normal and live a normal life. I am sorry he did not get the correct help to get him through his life, his music will live on forever as will Elvis's. Here I give you one of my all time favorite songs from little mikey!